Channels are used to connect different objects in the same panel (page) to multiple PLCs (or other devices) concurrently. In HMI Droid Studio 6.7.8.3078 (Beta), the communication parameters can be defined for up to eight (8) different channels. All objects have a new property Channel in the range [0,7] to connect the Object to a certain Channel. To use multiple Channels, the (new) setting for Number of channels in the app must be increased. The defult value is 1. 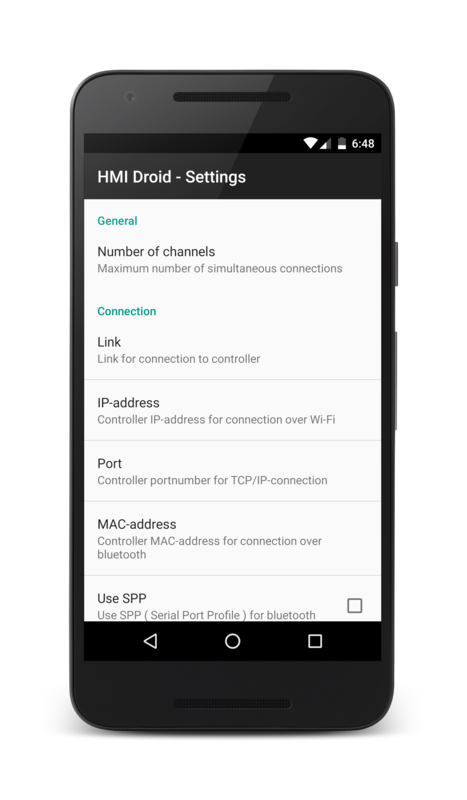 Note: When using multiple channels, at least some of the communication parameters must be entered in HMI Droid Studio. Any values entered in the settings in the app will be used as default values for all channels. The Title Row displays the name of the current panel (page). If there are panels (pages) to the right of the current panel (page), a >> symbol is displayed after the name. In the iOS-version of the app, there are two buttons in the Title Row (or Navigation Bar). Pressing the left button will navigate to the start panel (page). This button is hidden when the start panel (page) is active. The right button will open the menu. On iPhones, the space for displaying the app title and the name for the panel (page) is smaller than on most Android devices and long names might be truncated. 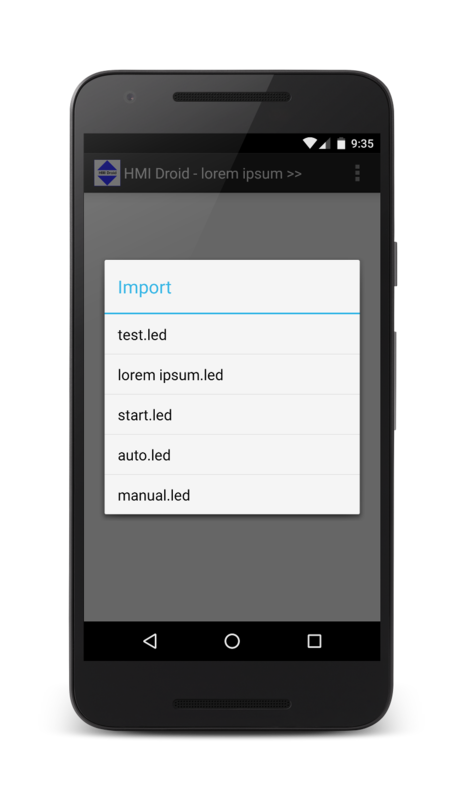 The menu contains the main commands in HMI Droid (Odrid HMI). On some Android-devices there is a dedicated menu button. On other devices, click on the three dots in the Action Bar to open the menu. The about command displays a dialog with version information, number of channels and number of loaded panels (pages). Note: In HMI Droid 1.7.8.92 (Android) and earlier, the About information is located in the Settings for the app. The workspace is the area on the screen where the different objects are located. When creating new panels (pages) you must first find out how large the panel (page) should be. 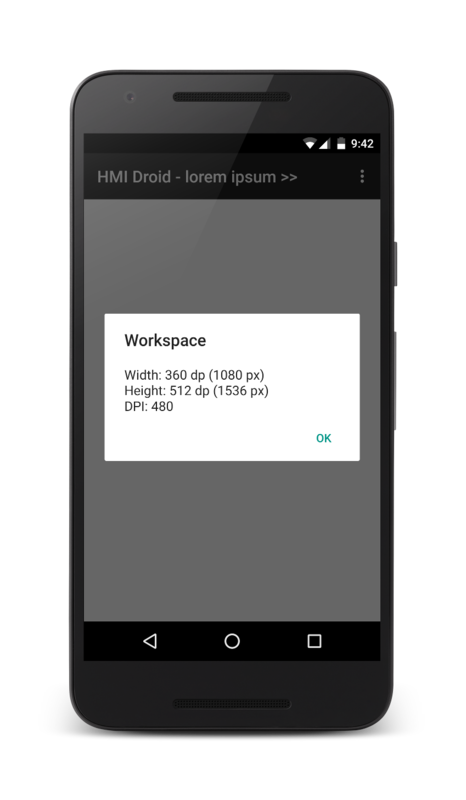 Use the command Workspace in the menu in HMI Droid (Odrid HMI) to find out the size of the workspace on your target device. The workspace is slightly smaller than the entire screen because the program's Action Bar (Android) or Navigation Bar (iOS) will use a portion of the surface. Moreover, the device's system bars will use some space at top and/or bottom of the screen. On a 10.1 inch tablet the workspace can therefore be e.g. 1280 x 696 dp in landscape and on a phone the workspace can be eg 320 x 496 dp in portrait. Note: Version 1.6.2 and later of HMI Droid (Android) has support for hiding the Action Bar and System Bar providing larger workspaces. Before there are any panels in the device the workspace has no given orientation. You can therefore find out the size of the workspace in both portrait and landscape. The orientation is determined by how you set the width and height and is always locked to either portrait or landscape. If you enter a width greater than the height the orientation will be landscape. If you enter a height greater than the width the orientation will be portrait. Note: HMI Droid 1.7.8.89 and later supports screen rotation and panels (pages) with mixed orientations. Use the command Settings in the menu to configure HMI Droid. Specify the type of link to use, IP or MAC address, port number, communication protocol and e.g. Modbus Id. These parameters can also be specified per panel (page) in the communication parameters dialog in HMI Droid Studio and in that case will override the values specified in the Android or iOS device. The settings are divided into the following categories. Note: To access the settings on an iOS-device, press the Home button, then press the Settings icon, scroll down the list and select Odrid HMI. Select link for the connection. Possible choices are Wi-Fi (TCP/IP), Ethernet UDP (UDP/IP) and Bluetooth. IP address. Enter the controller's IP address or host name on Wi-Fi or (mobile) internet. Port. Enter the controller's port number on TCP/IP or UDP/IP over Wi-Fi or (mobile) internet. MAC address. Enter the controller's MAC address on Bluetooth. The hexadecimal MAC address must be in all caps. Bytes must be separated by a colon. Use the SPP. Ticked if SPP (Serial Port Profile) shall be used for Bluetooth. Maintain connection. Select this option if the connection to remain connected even when HMI Droid is not visible on the screen. Note: Values entered here will only be used as default values and will be overridden by values entered for the panel (page) in the communication parameters dialog in HMI Droid Studio. Select the protocol. Alternatives are COMLI, Modbus/TCP, Modbus/TCP Class 1, Modbus RTU Class 1, SattBus COMLI, Siemens Fetch/Write and Simens S7 Communication (ISO on TCP). A slave-identity between 1 and 247 must be specified if COMLI, Modbus/TCP or Modbus RTU is used. 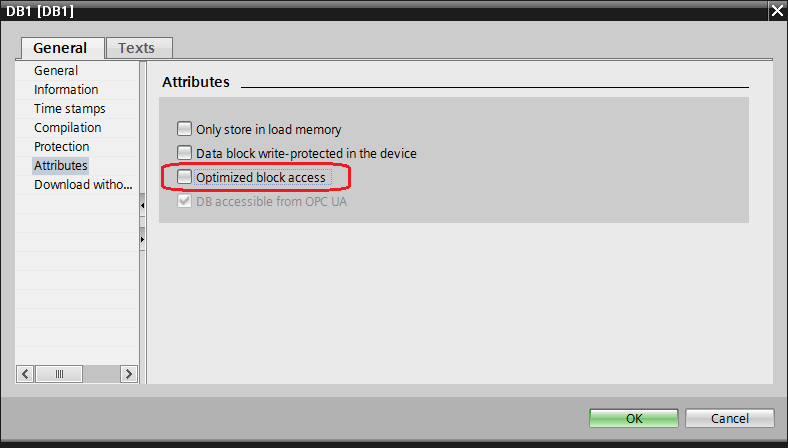 Default data block specifies which data block to use when Siemens Fetch/Write if the data block is not entered for each object. Life bit. Activate the life bit if the controller need to monitor that the communication between the Droid HMI app and the PLC/controller works. Address for control word specified as octal bit addresses to 16-bit control word. 32-bit register must be selected if HMI Droid is used with RievTech/xLogic PLCs. Select Word Swap for systems using "reversed" word order for 32 bit variables with the Modbus protocol. Last S7 Datablock for Siemens S7 controllers. For best performance, do not use a higher value than required. Default value is 255. This setting is available in HMI Droid 1.7.7.85 and Odrid HMI 1.2.29 or later. Modbus max block size is the maximum number of Modbus registers that will be read using one request message. Valid range is [1,125] and the default value is 55. 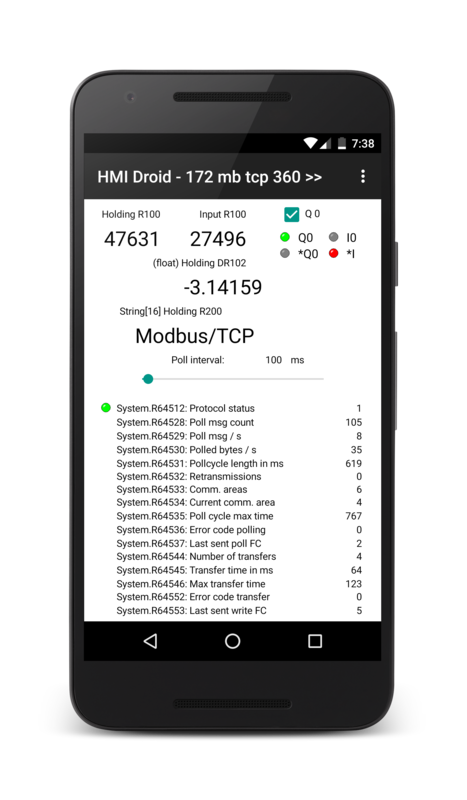 Modbus polling optimizer is on by default and will improve the performance but must be disabled for some Modbus devices. Center. Tick to center the panel in the workspace. This can be used if you want to use a panel that is made for the width 320 dp on a phone with a work at a slightly greater width, e.g. 360 dp. Scale. Tick to scale the panel to make it fit into the workspace. this can be used if you wish to use a panel that is made for the width 320 dp on a phone and run it on a tablet or vice versa. Center and scale can be used together or separately. Changes to these settings will not be visible until you either restart the HMI Droid or scroll multiple pages. If scaling and/or centering is used, the device must held in the "right direction" when the app is started for it to work properly. Full screen. Makes the workspace larger by hiding both the Status Bar and the Action Bar. 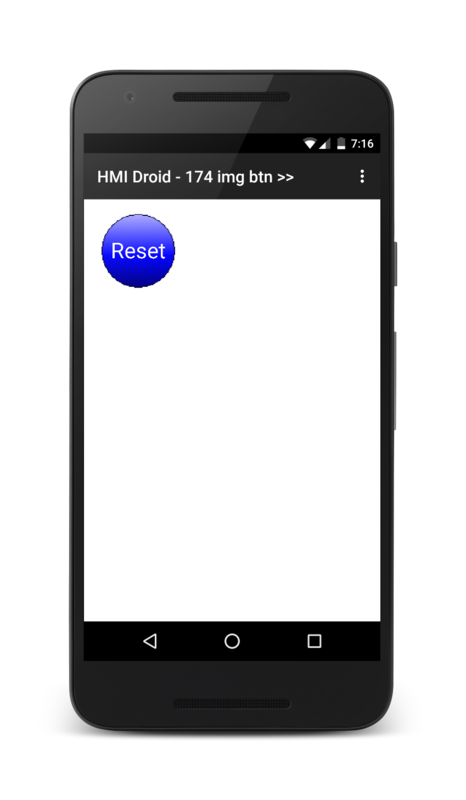 Available in HMI Droid 1.6.2 and later. If the device does not have a menu button the menu can be opened by pressing an empty area in the panel (page) for 3 seconds. In version 1.7.6.80 and later, it's also possible to use a Button with the Open options menu action. Hide Action Bar. Makes the workspace larger by hiding just the Action Bar. Available in HMI Droid 1.6.2 and later. If the device does not have a menu button the menu can be opened by pressing an empty area in the panel for 3 seconds. In version 1.7.6.80 and later, it's also possible to use a Button with the Open options menu action. The app must be restarted after changing Full Screen or Hide Action Bar when scaling or centering is used. Theme. In the iOS version of the app it's possible to change the color for the Navigation bar to dark instead of light gray. You can protect the settings against accidental or unauthorized modification by requiring a password must be entered to access them. Note: This feature is not available in the iOS version of the app. You can turn off the scrolling between different panels using swipe if you only want to be able to navigate by pressing Buttons. The command for deleting panels (pages) can be disabled. This protects files from being deleted by mistake. Note: This feature is not available in the Android version of HMI Droid yet. The command Panel information shows different properties for the current panel (page) file. Stamp refers to the date and time when the panel (page) file was last saved in HMI Droid Studio. This feature can be used to verify that the correct version of the file is installed in the Android or iOS-device. 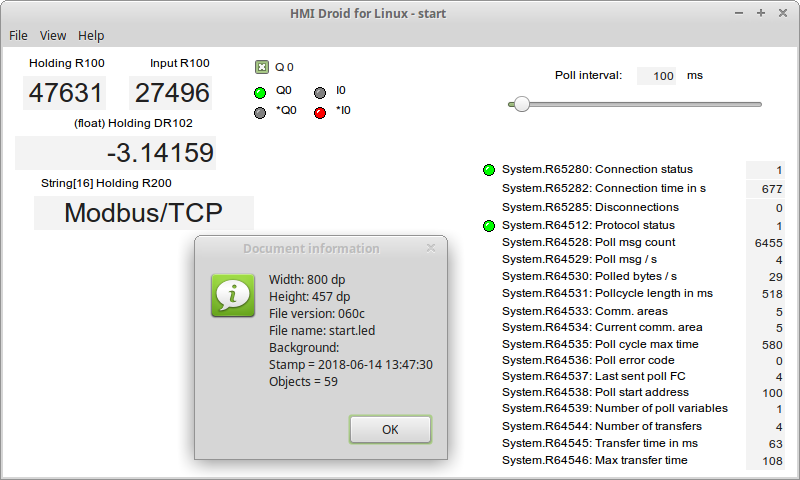 Use the Information command in the File menu in HMI Droid Studio to show the stamp and compare with the stamp in the target device. NOTE: The stamp information is available in panel (page) files edited with HMI Droid Studio 6.7.4 or later. The command Communication displays the current values for the most important communication parameters in a dialog. NOTE: In Odrid HMI (iOS) with version lower than 1.0.20, the dialog displays the initial value of Slave Id for the current panel and is not affected when writing to system variable System.R64518 to change the value. 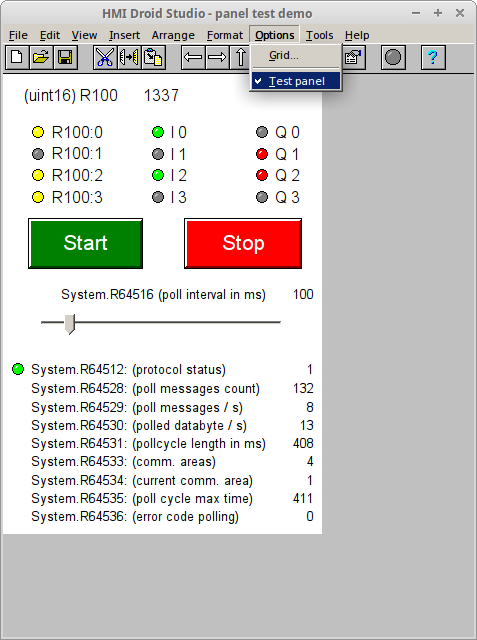 NOTE: The Poll interval parameter is displayed as "0 ms" until a connection is established with the controller. The example panel (page) 172 mb tcp 360 in the screenshots above is available for download. Note: This sample panel (page) uses all Modbus data types. The panel can be used with many PLCs without modifications but you may need to change addresses and/or variable areas to use it with your PLC/Controller/Gateway/Frequency converter etc. The import command in the Android version of the app is used for importing panel (page) files, images or text lists from the download folder on the Android device and into the work directory for the app. First select what kind of file to import. The list shows all files of the selected type available in the download folder. The delete command is used for deleting the current panel (page) file from the work directory on the target device. Note: Be careful when using the delete command. Deleted files can not be recovered, they have to be transferred from the PC again. PLCs/controllers that does not support reading of a large number of Modbus Holding registers or Input registers in a single Request/Respone cycle. Devices that have gaps in the Modbus variable map and does not support reading variables across these gaps. Example: The Schneider Electric gateway SR3NET01BD. In HMI Droid 1.7.8.89 and Odrid HMI 1.3.0 the polling optimizer can be disabled in the Settings. 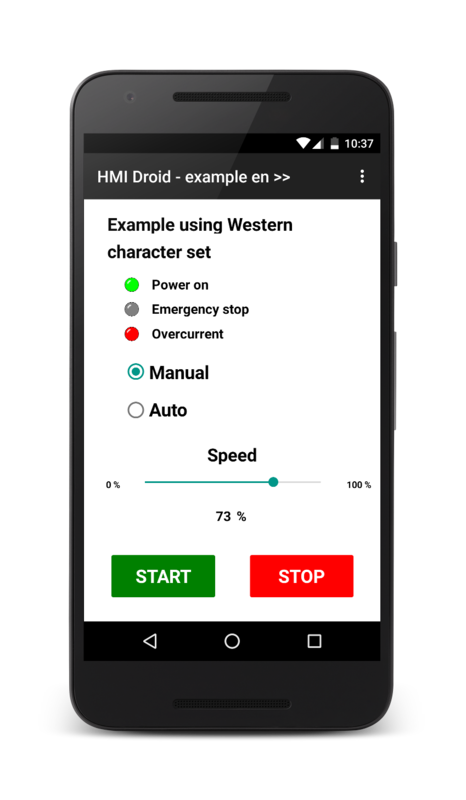 The Windows version of HMI Droid, currently in alpha state, can be downloaded free of charge by users who have purchased the Android or the iOS version of the app. Please contact us for more info. All panels (page) files must be stored in the folder "C:\Users\Public\Documents\HMI Droid\". All image files and text lists must be stored in the same folder as HMIDroid.exe is launched from. All settings for communication must be stored in the panels (pages). Navigation between panels (pages) can only be done with Buttons or Links. Images does not support transparency. 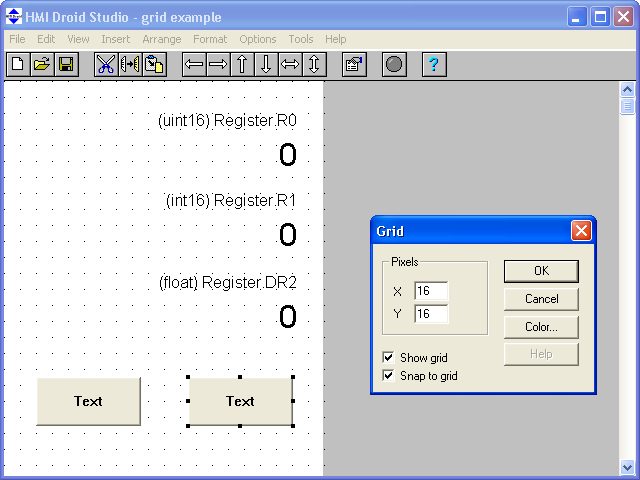 The panels (pages) to be used in HMI Droid are created and edited using the HMI Droid Studio. This program runs on Windows PC and each panel is saved as a separate file. This file is then transferred to the folder /Android/data/se.ideautomation.hmidroid/files. 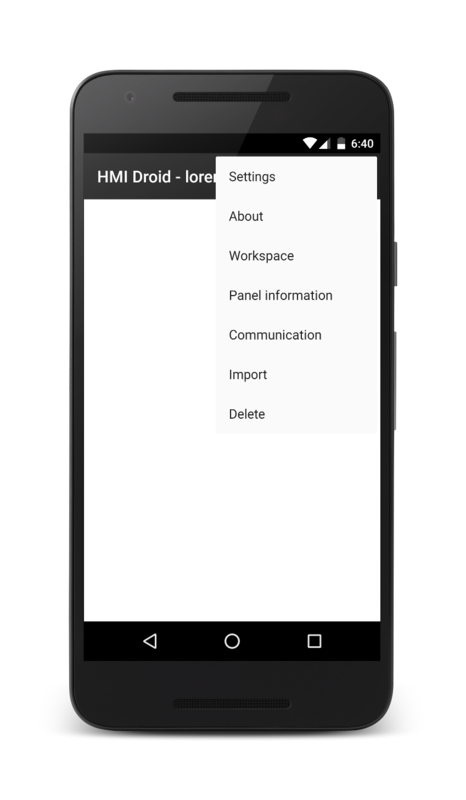 The folder is created automatically the first time you run HMI Droid. Any images and text files used to display a variable as a text should also be placed in this folder. Since there is not always a file explorer in an Android device, HMI Droid contains the command Import that can be used to copy the files to the correct folder. When you import, you can choose between panels, images and textlists. NOTE: On some devices and when using app versions before 1.7.5.78, the Import command can cause a ANR (App Not Responding) error. On iOS-devices you have to use the "Open in..." or "Copy to..." feature to transfer the files to the /Documents folder. NOTE: Version 1.0.17 of Odrid HMI has support for iTunes file sharing that can be used to transfer the files to the iOS device. After transferring the files, Odrid HMI has to be restarted to reload the panels (pages). The development tool HMI Droid Studio is available in two versions. A free version can be downloaded here. This version does not require any installation, just extract the zip file and then start HMIDroidStudio.exe. Do not rename or delete any of the extracted files. HMI Droid Studio can also be downloaded from the Micosoft Store at a low cost. This version does not have the 15 minutes time limit for the panel (page) test run feature. 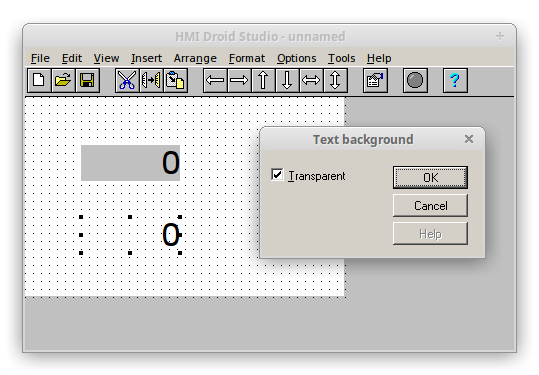 When starting the HMI Droid Studio a blank panel (page) is displayed. Use the Panel size command in the Format menu to make the panel (page) the same size as the workspace on your target device. If the size of the panel (page) does not match the workspace, the panel (page) will either be cropped or not fill the entire workspace when displayed on the device unless scaling is enabled. 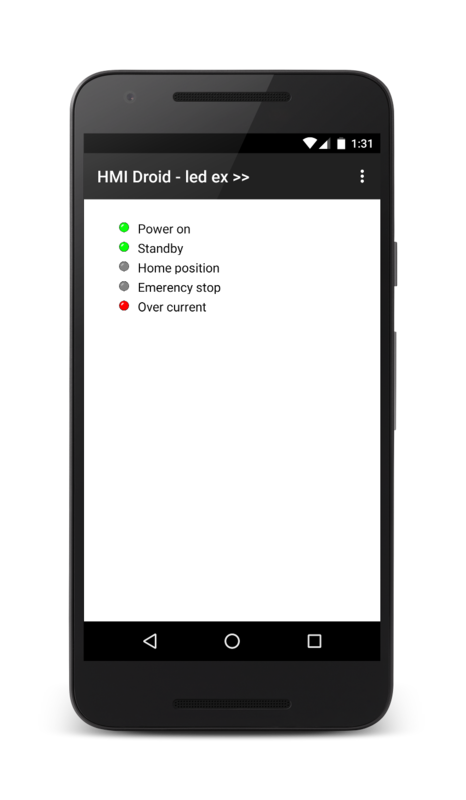 Save the first panel (page) as start.led which is the name of the panel (page) to be displayed when starting the HMI Droid. When saving a panel, a backup of the old file is created with the same name but with .~le as file extension. If you will have many panels (pages) it may be advisable to put some buttons for navigation, especially in the first panel, so you do not have to browse so far. 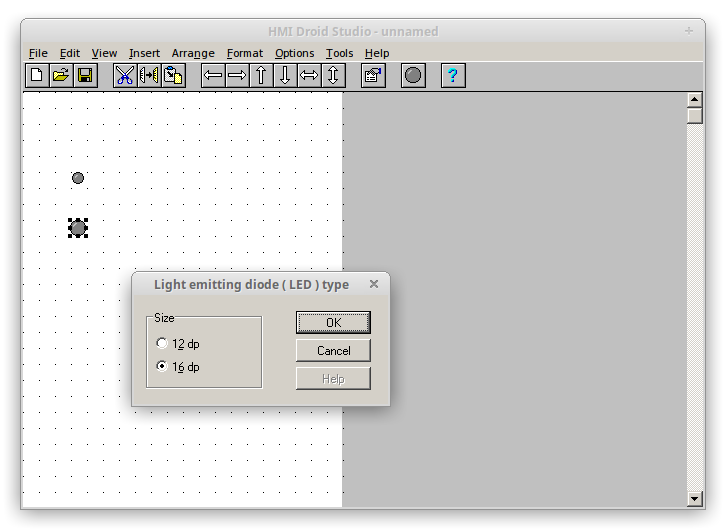 The panel (page) that is displayed when HMI Droid is launched must be named start.led. The other panels (pages) can be named arbitrarily, but the file name must be in lower case and the extension must be .led. The name must be a valid file name in both Windows and Android or iOS. If you will navigate from one panel to another panel by using the buttons you have to limit the length of the filename to a maximum of eight characters. This is a legacy of LEDpanel and Windows 3.1 and will changed later on. HMI Droid shows the panel start at the left and all other panels sorted alphabetically to the right of this panel. If you see ">>" after panel name in the app action bar (or navigation bar) it means that you can scroll to the right. If not the ">>" is appearing, you are on the last panel (page). Filename for optional background image must not contain a file path. Store the image files that will be used in the same directory on the PC as the panel files. Always save the panel (page) on the PC in this directory before selecting an image filename. This will make HMI Droid Studio to automatically remove the path from the image filename. Warning: The target device may run out of memory if very large images are used! From version 1.6.4 the background color of the panel (page) can be choosen. The color value is RGB, but in the reverse byte order. Enter FFFFFF for white. Note: The current version of HMI Droid Studio does not support alpha channel (transparency) in images. For best result, use images with the same background color as the panel (page). In the dialog panel properties, you can specify whether to return to the start panel after a period of inactivity. The panels (pages) in HMI Droid are built up with different types of objects. A panel (page) may also contain a background image. Note: The objects must not overlap, it is not possible to place e.g. a LED on top of a button. LEDs can be used to view the status of boolean variables. The variables are automatically retrieved from the selected variable area in the controller/PLC. Bit address for the variables can be defined in different ways depending on which communication protocol that is used. For COMLI octal address is used. To interface with e.g. Siemens systems you can also enter the address in the format "byte number dot bit" for example, DBnn.DBX12.3, or "register number colon bit" for systems using Modbus/TCP or Modbus RTU. Selection of address format is done with a command in the Format menu. LEDs are available in two sizes, 12x12 and 16x16 dp. Use the command LED type in the Format menu for choosing size. Channel The Channel to read variables from. Feature available in HMI Droid Studio 6.7.8 and later. Variable area The variable area which the LED will read variables from. Data block number The data block the LED will read from when using the Siemens S7 Communication (ISO-on-TCP) protocol. Animation How the LED should work. If the specified variable for a certain color is true, the LED will illuminate with that color. If multiple conditions are met, the color will be determined by the condition with the highest priority. Bit address The bit address of a variable in the selected address format. Invert Inverts the signal so that the LED illuminates if the signal is low. Priority Precedence for the colors of multiple variables are used. Address format Displays the address format which you have chosen to use. It has to correlate with the type of controller that you should connect to. Show as rectangle Displaying a rectangle instead of a round LED. Use any size Use any size and not just the 12x12 and 16x16 dp sizes e.g. for Andon systems with requirements for readability at a long distance. Comment Here you can write a comment. Texts/Labels are typically used together with LEDs, Numeric variables, Input fields, Sliders, Bar indicators or Line charts. Alignment Choose between left, center and right. The text maintains its position if the length or font change. Fit width and height Text object's size is automatically adapted to the length of the text and the selected font. Fonts are not identical in Windows, Android and iOS. If the object is cropped or truncated on the target device you should uncheck the "Fit width and height option" and manually increase the size of the object. Link Name of a panel (page) without extension or a web address that will open when you touch the text. A web address has to begin with either http:// or https:// eg http://www.ideautomation.se and will open in the default browser. Links are displayed with blue underlined text. Some values for Link can be used for relative navigation between panels (pages). |<< The first panel (page). << 10 panels (pages) to the left. |< The panel (page) to the left of the current panel (page). >| The panel (page) to the right of the current panel (page). >> 10 panels (pages) to the right. >>| The last panel (page). The link feature is available in HMI Droid V1.7.4 and later. Displays the current time in hh:mm:ss format. Displays the current date in yy:MM:dd format. Buttons can be used to manipulate variables and to navigate between different panels (pages). For a button to work well on a phone or tablet, it must not be too small, but should be at least 48 x 48 dp large including any gaps. 48 dp represents about 10 buttons vertically in portrait on a phone with a 5 inch screen. Multi line text The text should appear on multiple lines. Hard line breaks normally works better than word wrapping. Variable area Variable area in the controller that is used when the button control variables and for optional animation of the lighted button. Data block number Data block that will be used if the variable area is Data block. Action What should happen when you press the button. Choose from the following actions. Change panel Navigate to another panel (page). Reset SR flag Reset a boolean variable. Set register Write a constant value to a 16-bit integer variable. Set flag (momentary) Set a boolean variable on press, reset the variable on release. Set SR flag Set a boolean variable. Toggle flag Toggle a boolean variable. 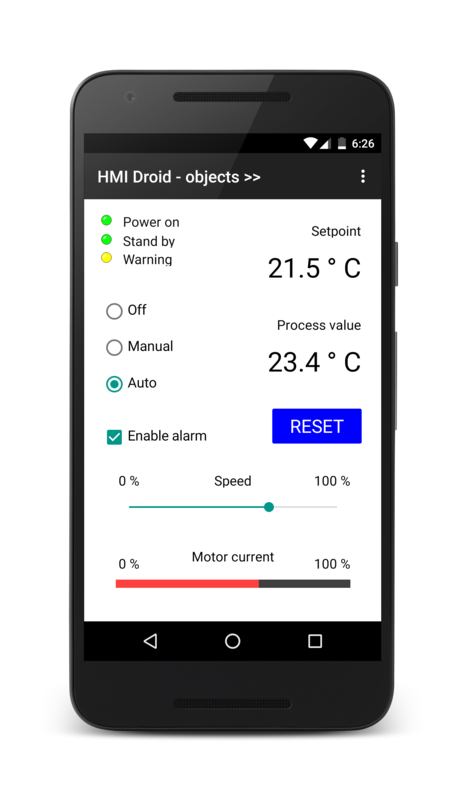 Other actions have presently no function in HMI Droid. Choose... Select the file name for the action "change panel". Lighted pushbutton Check if the button should be a lighted pushbutton i.e. if the button should illuminate when the selected condition for the animation is true. 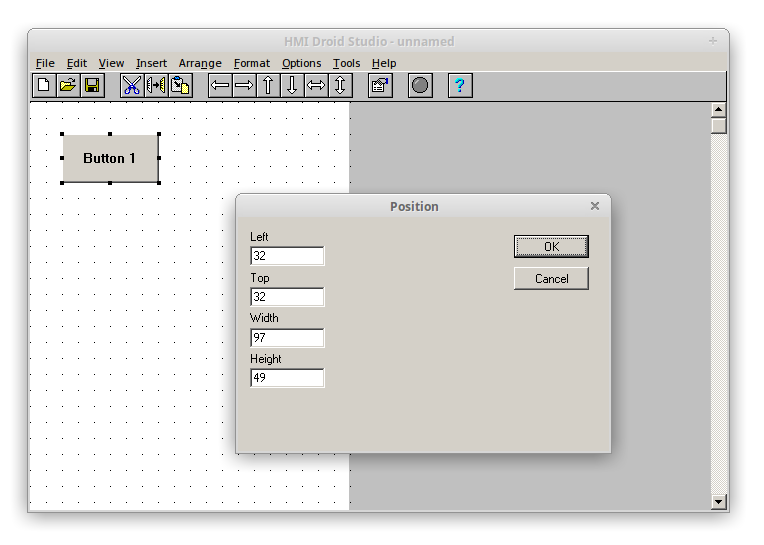 Animation Open the dialog for configuring animation. Image button Use images to draw the buttons different states (Normal, Pressed) instead of using a native button. This feature is available in HMI Droid 1.7.4 or later. Setup Open the dialog for configuring the image button. Function key Indicate whether the button should be activated with a function key. This feature is not available in the Android and iOS versions of HMI Droid. Password Enter any password for the action "Change panel". If a panel contains buttons for navigation that is protected with a password, you can not navigate away from this panel by using a swipe gesture. Avoid read / Write only Avoid to read variables from the controller/PLC for performing bit manipulation operations. Can be used with Modbus datatype Coil except when toggling bits. Feature available in HMI Droid Studio V 6.7.7.2064 and later. A button can be animated so it mimics a lighted pushbutton and illuminates with a certain color when a condition is true. Color The color that the button should show when the boolean condition is true. Bit-address Bit-address for the boolean variable. The same variable area and datablock number are used as for the Button action. Invert Inverts the signal so that the button illuminates if the signal is low. Use standard colors Use a standard color scheme for the blue, red, yellow and lime colors. Background color Color that the button will show when the boolean condition is false. More colors (black, blue, cyan, gray, green, lime, magenta, maroon, navy, olive, purple, red, silver, teal, white, yellow. orange and steelblue) can be used with HMI Droid Studio V6.7.6.1060 or later. Select the image files to be used for displaying the Normal and Pressed state of the button. Image files must be stored in the same directory as the panel (page) files. In HMI Droid Studio V 6.7.6.1060 and later, the image button can be animated. Note: The Objects variable area can currently not be used when animating an image button. Note: The current version of HMI Droid Studio does not support alpha channel (transparency) in images. On some Android devices, a small rectangle will be drawn inside the image button before the image is drawn. For best result, use images with the same background color as the panel (page). Numeric variables (variable fields) are read from the selected variable area and displayed in the way you specify in the object's configuration dialog. If you check the box "Allow change" you can change the value online. Tap and hold the numeric variable (variable field) object to open the change value dialog. In order to tap a numeric variable (variable field), it should be at least 48 dp high. The size is controlled by the font, a font size of at least 20 points is recommended. Variable area Variable area to read from. Datablock / Object id (in) Enter the number of the datablock if the selected variable area is Datablock. Object id if the variable area is Objects. Address / value Address of the variable or 16-bit value when using area 'Const'. Addresses are (normally) entered in decimal. In some controllers, such as Siemens S7, byte addressing is used. Double register Specifies that the variable is a 32-bit variable instead of 16-bit. Format Controls how the variable is displayed. Settings... Setup number formatting for hexadecimal and floating point numbers or configure the PHYS format. Source Name of the text file containing values and the texts to display for each value at the the format As text. Each line should begin with an unsigned decimal value followed by a space and then the text to be displayed. The maximum length of the text is currently 80 characters. The text file must be a plain text file that you create with e.g. Notepad. If the text file is edited, the panel (page) has to be closed and reopened to load the new content. Default Text to be displayed if there is no text available for a certain value. Allow change Allows the variable is changed from the panel. It's only if you have ticked this box that the dialog Change value will contain a button for OK. Fit width and height Adjusts the size of the object to the current format and the selected font size. For the format As Text, however, the width is always adjusted manually. Show in input dialog Specify the items to be displayed in the change value dialog. Comment Optional comment for the numeric variable. Text that is entered here can be viewed, along with the variable name, in the dialog used for changing the value of the variable. The object input field is similar to the object numeric variable. Variable area Variable area in the controller that the input value should end up in. Default - Variable is mapped to the default area according to the selected communication protocol. I - Variable is mapped to input words. Data block - Variable is mapped on a data block. M - Variable is mapped to memory words. Register - Variable is mapped on a register. Q - variable is mapped to output words. Address Address of the variable. Data block Number of the data block to be used if the variable area is data block. Format In what format the numeric variable will be displayed and how the entered value should be interpreted. Show in the input dialog Specify what should be displayed in the dialog that is used to enter a value. Comment Write an optional comment for the entry field. Text entered here can be shown ( along with the variable name and format ) in the dialog used to enter a value. The object image is used to display one or more images which is smaller than the entire workspace. If you want a picture fills entire workspace, you should use the background image instead. In both cases, the image shall be in png format and file name must be specified without path and be exactly the same as for file with respect to uppercase/lowercase characters. Windows makes no difference in the file names IMAGE.PNG and image.png but in Android and iOS it is the names of two different files. A Slider Bar is used to change a numeric variable. The change is made in the controller when you let go. A Slider Bar displays the value of the variable in the controller dynamically except just when you pull it. In the dialog for configuring a Slider Bar, select the variable area and enter the variable address and desired range. Minimum and maximum values specified between 0 and 65535 for unsigned and between -32768 and 32767 when signed. Max must be greater than min. Dead zone helps finding a zero value that is not in an end position. The Update immediately option available in HMI Droid Studio V6.7.6.1061 and later, will write a new value to the PLC as soon as the Slider is moved. This feature requires a fairly fast connection to the PLC. Currently only 16 bit integer values are supported but 32 bit integer and floats will be implemented in the next major update. The Bar Indicator Object is used to display the value of a numeric variable using a horizontal or vertical bar. In the dialog for configuring a bar indicator you specify eg variable area and variable address as well as desired range. Positive values are to the right and up. Status bits for Underflow and Overflow can be read at address 16:0 and 16:1 via the variable area Objects. Note: Currently only 16 bit integer values are supported but 32 bit integer and floats will be implemented later. Line Graphs can be used to show a number of numeric values as a curve. The function can used e.g. to display trend graphs. Note: The PLC/controller must do the logging and provide a table containing all values with the first value at the specified address. In the dialog for configuring a line chart you can specify, among other things variable area and variable address as well as desired range. Currently only 16 bit integer values are supported but 32 bit integer and floats will be implemented later. The line graph can calculate the minimum, maximum, mean, standard deviation, coefficient of variation and difference between maximum and minimum. These values can be read from the local variable area. The address in the local variable area is calculated by adding the local base address and the index for the statistical function. 999 Last reserved variable address. With the checkbox it's easy to display and manipulate boolean variables. 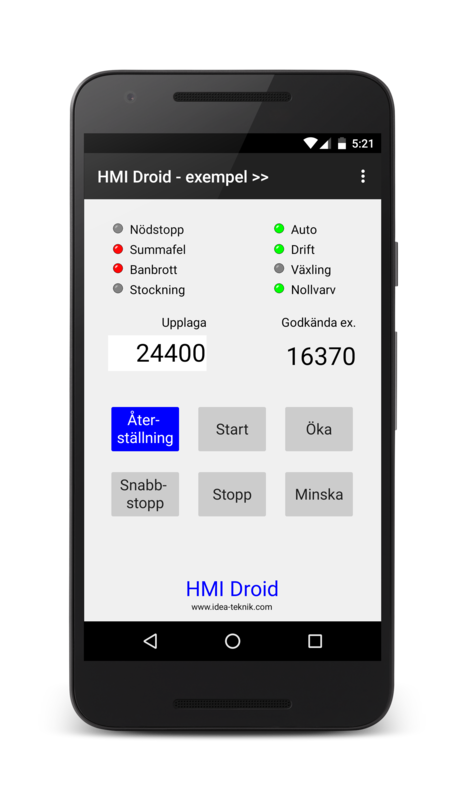 Note: Checkboxes in the Android version of HMI Droid will not be located exactly the same as in HMI Droid Studio. iOS does not include native radio buttons and checkboxes. With the radio button it is easy to view and manipulate numeric variables of integer type. The radio buttons that uses the same variable will form a group. Buttons in a group must use unique values e.g. 1, 2, 3 etc. Note: Radio buttons in the Android version of HMI Droid will not be located exactly the same as in HMI Droid Studio. A ST (Structured Text) Program Block contains program code that will execute in the panel context. All variables referenced by the ST program code will be automatically polled from the PLC/controller in the same way as any variables used by other objects such as LEDs, numeric variables and bar indicators. 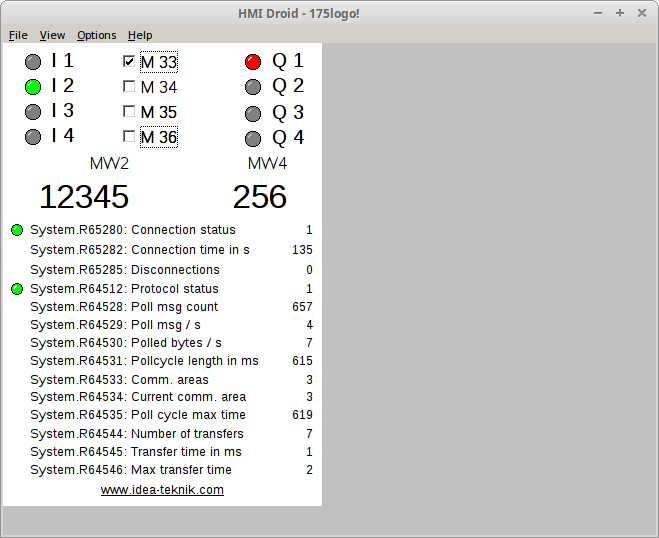 It will also be possible to test run the ST Program Blocks in HMI Droid Studio using the test run panel (page) feature. For all objects that displays text, typeface name, style and text size can be selected in the Font dialog. For all objects that displays text, the character set can be selected in the font dialogue. Currently the following character sets are supported: Western, Greek, Turkish, Baltic, Central European, Eastern European, Cyrillic, Japanese (Shift JIS), Chinese (GB2312, BIG5), Korean and Arabic. 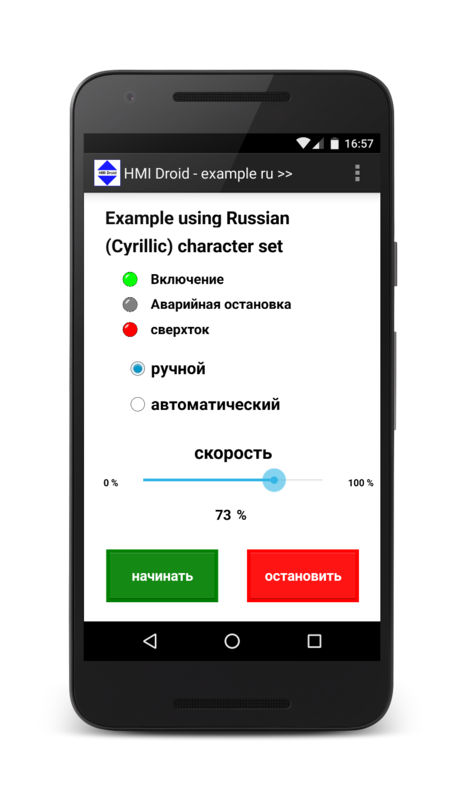 The iOS-version of HMI Droid currently supports the Western, Greek, Turkish, Central European, Eastern European, Cyrillic and Japanese (Shift JIS) character sets. Update: The iOS version 1.0.22 has (experimental) support for Chinese character sets. Below are a few examples of different character sets. The example panels (pages) in the screenshots above are available for download. Controls the opacity of the text, date, time and numeric variable objects. This property has currenly no effect in the Android and iOS-versions of HMI Droid. Choose size for selected LEDs. Changes the position and size for selected objects numerically. Note: Size can not be changed for LEDs with fixed size or for objects with the "Fit width and height" option selected. 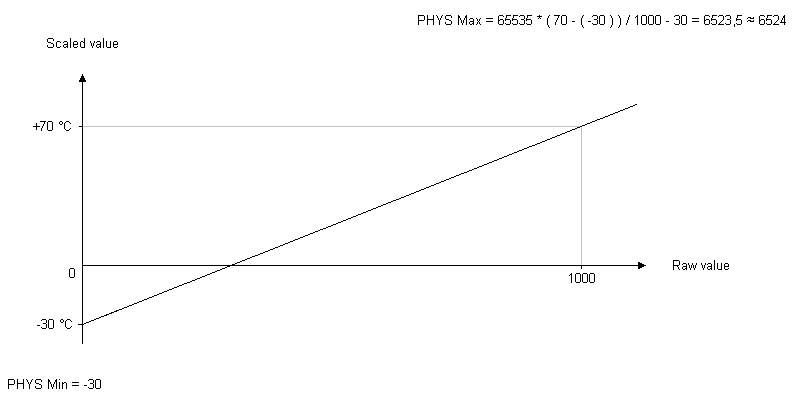 The PHYS function can be used to translate a register value to a certain physical value and back for variables and input fields. Register value range between 0 and 65535 can be scaled to represent a certain range, for example, an analog input or output. PHYS is configured in its own dialogue where you specify minimum value, maximum value, number of decimal places and optionally a unit. 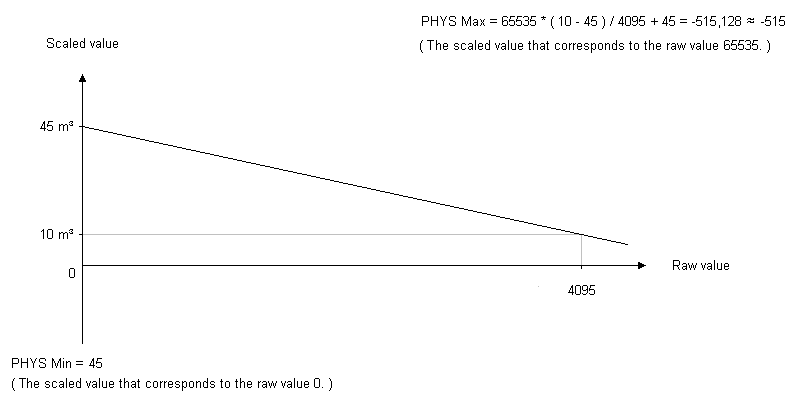 The value for Max can be set lower than the value for Min for achieving a negative slope. A typical usage is for "reversing" the output from an ultra-sonic transducer that measures the top of the water level from the top of the tank. If the variable is signed ie covering -32768 to 32767 instead of 0 to 65535, select "Use two's complement form of register value". By choosing suitable values for min, max and decimals you can also utilize PHYS to handle integer values as tenths or hundredths. The command address format in the format menu is used to select how the bit addresses for boolean variables should appear in the dialogues that are used to configure LEDs, Buttons and Checkboxes. COMLI Octal between 0 and 37777. Modbus Default or Register As a register address:bit number with bit number between 0 and 15. Register address specified in decimal with no leading 'R'. The highest bit address that can be used is currently R4095:14 but it will be extended to R65535:15 in the future. Modbus I or Q Decimal between 0 and 65535. RREX Decimal between 0 and 255. Siemens As byte number:bit number with bit number between 0 and 7. Variable area I and Q are available if you have chosen Modbus/TCP class 1 or Modbus RTU class 1. 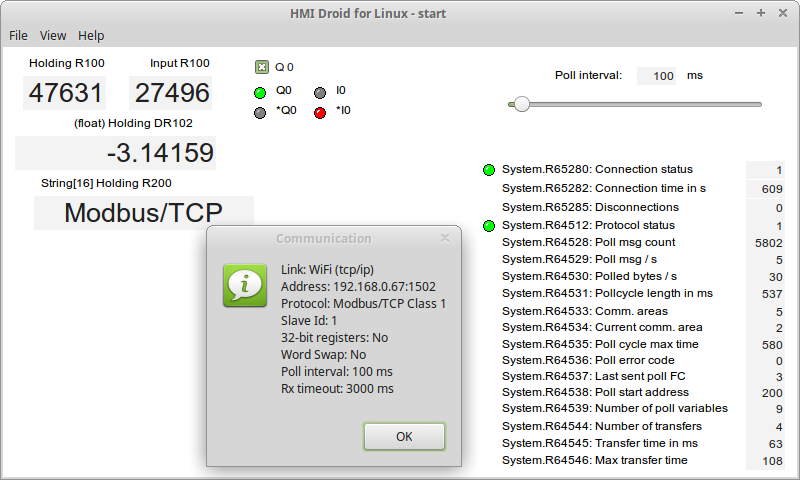 To enable the use of HMI Droid with different controllers, you can specify the communication parameters for the connection and the controller per panel (page). The communication parameters you specify per panel (page) will always override the default settings made in the HMI Droid app on the target device. When navigating to a panel (page), a new connection will be established if e.g. link type, IP address, or port number differs from the current connection. Note: It's recommended to tick the left check box for all unused parameters like e.g. Life bit, 32-bit registers and Word swap. This will prevent activating the options by mistake from the settings in the Android or iOS-device. Typical setup for communication with Siemens LOGO! 0BA8. HMI Droid Studio has a feature for testing panels (pages) without first transfer the panels (pages) to an Android or iOS-device. Currently the test run function supports Modbus/TCP, Modbus RTU and Siemens S7 ISO-on-TCP protocol over TCP/IP. The other protocols and different connections like Bluetooth SPP and UDP/IP will be added later. 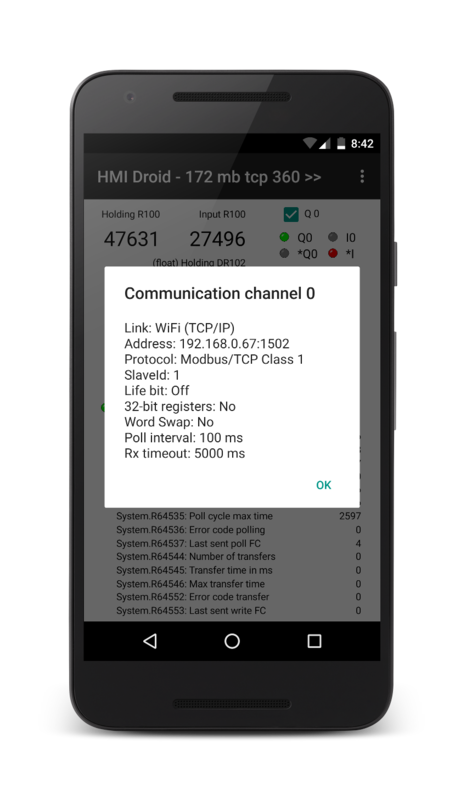 For Modbus/TCP, the minimum required communication parameters are Link that should be set to WiFi (TCP/IP), IP-address (or host name), Port, Protocol, Slave id and Poll interval. The command "Test panel" in the Options menu is used to start and abort the test run panel (page) mode. Most of the HMI Droid features, including the system registers, are working exactly the same way as on a real Android or iOS-device but navigation between different panels (pages) is not supported and the Change value feature for numeric variables does not support all formats. When starting the Test run mode, HMI Droid Studio always makes a plausibility check for the communication parameters for all used channels before the test run mode is entered. 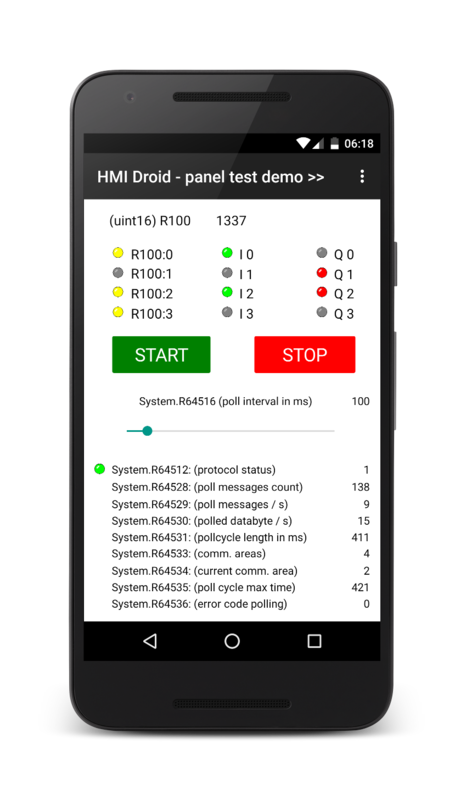 Note: The free version of HMI Droid Studio has a time limit of 15 minutes for the test run mode. Currently, the following communication protocols are available in the Android version of the HMI Droid. The messages that are implementrerade is 0, 1, 2, 3 and 4, which means that you can access the registers 0 to 3071 (decimal) and flags between 0 and 37777 (octal). Note: The COMLI protocol is not available in the iOS and Windows versions of HMI Droid. This protocol can be run over TCP/IP or UDP and typically uses port 502 in the PLC/controller. The driver for Modbus/TCP meets Class 0 and is using functions 3 and 16 of the Modbus specification. Maximum 64,512 Holding registers can be addressed. The first register always has address 0 even if the designation for the first register in the controller/PLC is 40001 or 400001. Logical variables ( = memories/flags ) can be mapped to bits in holding registers by writing Rnn:b, where b is the bit number between 0 and 15. Bit 0 is the least significant bit in the register and have weight 20 which is the first. Bit 15 is the most significant bit in the register and have weight 215 which is 32768. With this protocol, you write always at least two bytes at a time. This means that controller should not affect bits in words containing bits HMI Droid will write. One should also not affect bits in the same word as HMI Droid writes from any other system around the same time. A controller using the Modbus normally has "big-endian" byte order, which means that in "double register" the high word is stored first. Starting with version 1.6, it is possible to choose whether high or low word is stored in the first register using the Word Swap option. The same basic function as Modbus/TCP but digital signals for e.g. LEDs and Buttons can be connected to inputs and outputs instead of just bits in the Holding registers by selecting variable area I for inputs and variable area Q outputs. The following functions in the Modbus specification are used for inputs and outputs in variable areas I, AI and Q. Note: HMI Droid always reads full bytes when reading Discrete Inputs and Coils. Bit addresses will be aligned modulo 8. Like Modbus/TCP class 1 but shorter header and CRC16 checksum. In most cases a serial port is used on the controller. Can be used with connection types WiFi (TCP/IP), Efternet UDP (UDP/IP) or Bluetooth. Link must be set to "Ethernet UPD" (UDP/IP) and port number is usually set to 2999. The SattBus COMLI protocol is not available in the iOS-version of HMI Droid. This protocol can be run over TCP/IP and uses two ports on the controller. One port for "Fetch passive" and one port for the "Write passive". For Siemens CP 343-1 is normally port number between 1025 and 65535 used. The port number you enter in the settings will be used for Fetch and the port number +1 will be used for write. Step 7 uses byte addressing of the variables. 16-bit memory words that are in sequence are named eg MW0, MW2, MW4 or DBnn.DBW0, DBnn.DBW2, DBnn.DBW4 etc. The driver for the Siemens Fetch/Write protocol can address bytes 0-127 for inputs, outputs and memory. If you use the the data block you can address words 0-2047 in the data block which corresponds to byte 0 and 1 to byte 4094 and 4095. Data block between 1 and 255 can be used. With this protocol, you write always full byte at a time, and in the data block always two bytes. This means that the controller must not write bits in bytes, or words of the data block that contains bits that HMI Droid will be writing. A controller that uses Siemens Fetch/Write normally have "big-endian" byte order, which means that in a double word the low word is stored first. The Siemens Fetch/Write protocol is not available in the iOS-version of HMI Droid. Basically the same functions as the Siemens Fetch/Write-protocol. Link should be set to WiFi (TCP/IP) and Port number should normally be set to 102. HMI Droid will connect as an OP. Make sure that the hardware configuration for the Siemens S7 PLC has enough connection resources for OP. 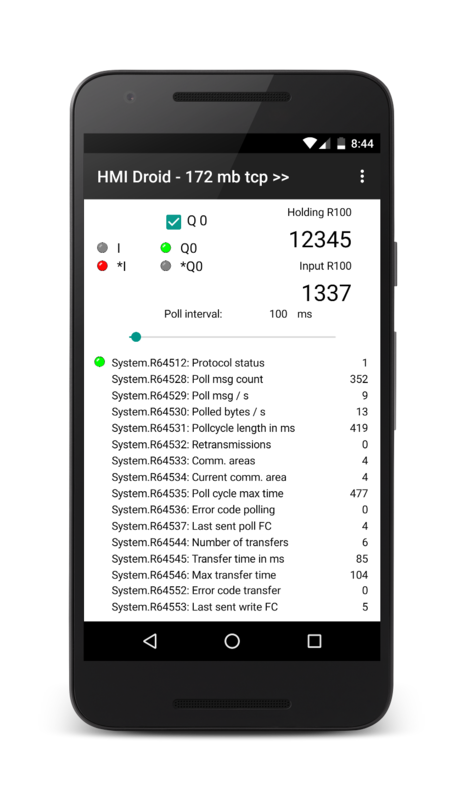 In version V1.7.2 of HMI Droid, other values for rack and slot can be used for connecting HMI Droid to Siemens S7-1200, S7-1500 and LOGO!. Currently, only the first 255 data blocks can be used but the range will be expanded. Update: In HMI Droid 1.7.7.85 (Android) the maximum adressing range is 65535 datablocks. The address range for Inputs, Outputs and Memory is 2048 words (4096 bytes). Note: 32-bit variables in datablocks (DBxx.DBDyy) and 16-bit variables in datablocks (DXxx.DBWyy) must use even byte addresses. LOGO! 0BA8 Watch short demo on YouTube for Android and iOS. Note: When using the LOGO!, 1200 and 1500, some settings in the PLC are required. Please see the appendices for LOGO! and 1200/1500 for details. 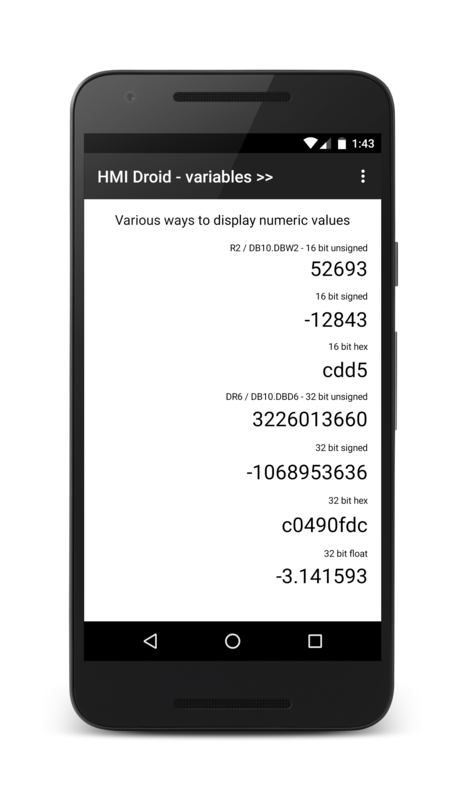 HMI Droid handles logic and numeric variables. Different controllers normally store the variables in some specific areas. These areas are referred to and handled differently depending on the communication protocol used. Therefore, there is a "mapping" of how the variables used in the various items included in a panel are referenced in the controller. Explicit mapping is done by selecting the variable area and possibly also specify the of data block. If you do not explicitly choose a variable area, then an implicit mapping will be done to the default are chosen for the variable type and the current communication protocol. The table shows the default mapping occurs and the mappings can be done at present. In addition to the options for variable area as shown in the table above, you can also choose System, Local, Const and Objects. The choice System can be used to explicitly specify that the system variables are referred to. The choice Local means that the local variables in HMI Droid will be used. This may e.g. used for the line graph statistics functions or in testing and demo purposes. When the possibility to write PLC code type program executed in the HMI Droid and/or the panels will be introduced, the local variables also be used for this. Connecting a Bar Indicator to a Numeric variable object that uses PHYS scaling with negative slope. In order to access a specific Modbus data type, you have to choose the matching variable area. 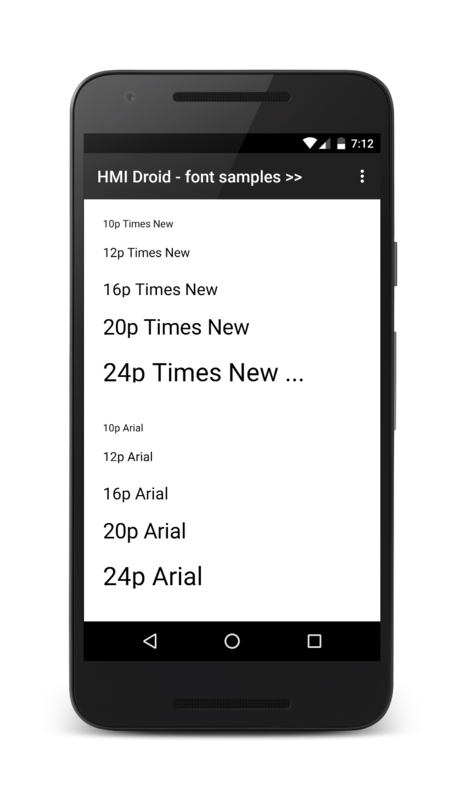 Note: All address are 16 bit in the current version of HMI Droid Studio. The Modbus specification does not include any 32 bit variables. Many PLCs and other controllers can use two consecutive 16 bit registers as a 32 bit variable but the order of the high and low words can be different on various devices. Since Modbus uses big-endian byte order, the normal word order in HMI Droid stores the 16 most significant bits in the register with the lower address. When using 32-bits integer or IEEE 754 single precision floats, the word order have to be reversed for some PLCs in the Communication parameters or in the settings in the Android or iOS device. Using an incorrect setting for word order will make 32-bit integer and floating point variables display the wrong value. The control word works in a similar way as coordination area in Siemens operator panels. The control word's life bit should be monitored by the controller if the panel (page) is used for manual operation of any machine movement. This allows the controller to stop machine movement if the connection between the operator panel and the controller ceases. b0 is the startup bit that goes from 0 to 1 when the panel is connected to the controller. b2 is the life bit that toggles with about 0.5 Hz. Note: The address to the control word is a bit address and is entered in octal format. For Modbus Holding register, multiply the register address by 16 and convert it into octal format. Example: R400011 has Modbus address 10 and octal bitaddress 240. Other formats for the control word address, e.g. Rnnn where nnn is the Modbus address to the Holding register, will be implemented in upcoming versions. Note: In HMI Droid 1.7.8.89 and Odrid HMI 1.3.0, the communication diagnostics dialog displays the address for the control word with life bit in a suitable format for the selected protocol. Modbus will use Rnnn and Siemens S7 Communication (ISO-on-TCP) will use DBxx.DBWyyy. There are a number of system registers that can be read for the diagnosis of the connection and the protocol. The system registers can be displayed in a similar way as one showing a variable that refers to the controller. This means that you can customize your own diagnostics and tailor it to your needs. Some systems registers are writable and you can use different GUI objects like Numeric variables, Buttons, Radio buttons or Sliders to manipulate them. 65280 Link status. 0 = disconnected, 1 = connected. 65282 Time in seconds the link has been connected. 64512 Protocol status. 0 = disconnected, 1 = connected. 64513 Code for the selected communication protocol (Read-only). 64514 Enable for the life bit. May be written. 64515 N/A. Reserved for life bit address (Read-only). 64516 Minimum poll interval in ms. May be written. 64517 Current Modbus Slave Id (Read-only). 64518 Requested Modbus Slave Id (Read/Write). 64519 Modbus max block size (Read-only). 64528 Number of polling queries. May be written. 64529 Polling queries per second. 64530 Polled data bytes per second. 64531 Time for polling cycle in ms.
64532 Number of retransmissions. May be written. 64533 Number of communication areas. 64535 Maximum time for polling cycle in ms. May be written. 64536 Error code during polling. May be written. List with main Modbus exception codes on Wikipedia. 64537 Last sent Modbus FC during polling. May be written. 64538 Starting address for the last Modbus read request. Read only. 64539 Number of variables for the last Modbus read request. Read only. 64540 Modbus RTU respone time in ms (Read only). Available in Odrid HMI 1.3.0 and later. 64541 Modbus optimizer state (Read only). Available in HMI Droid 1.7.8.89 and later and Odrid HMI 1.3.0 and later. 64544 Number of transfers. May be written. 64545 Time of transfer in ms.
64546 Maximum time for transfer in ms. May be written. 64552 Error code during transfer. May be written. List with main Modbus exception codes on Wikipedia. 64553 Last sent Modbus FC for transfer. May be written. Note: This sample panel (page) uses all Modbus data types. The panel (page) can be used with many PLCs without modifications but you may need to change addresses and/or variable areas to use it with your PLC/Controller/Gateway/Frequency converter etc. There are a number of logical variables (flags) in the system variable area which can be used to show the if the communication works. Use the Siemens S7 Communication (ISO-on-TCP) communication protocol. Note If datablocks above 255 are used, the setting for Last S7 Datablock in the Android or iOS device must be increased. For the LOGO!, Rack must be 0 and and Slot must be 0. Use the following setup for the LOGO!. The VM area in the LOGO! is accessed as Datablock 1 in HMI Droid. For the 1200, Rack must be 0 and and Slot must be 1. Setting up the communication for a standard PLC that uses Modbus/TCP is normally quite simple. Other configurations are more complex like e.g. Modbus RTU over Bluetooth. Some ideas for how to proceed systematically. Always start by monitoring the system registers. These variables provides very useful information about the connection and may also contain different error codes. The list below is mainly based on a large number of real support cases from the beginning of 2014 and forward. 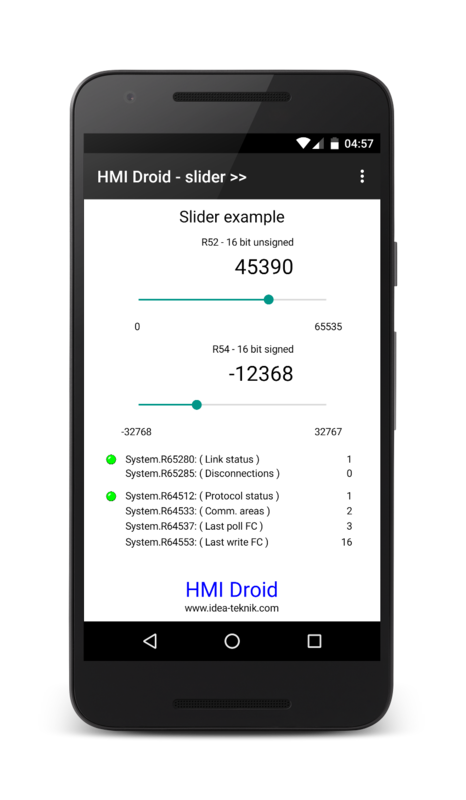 HMI Droid is always master and will only connect to a device that is slave. Communication parameters entered for the panel (page) will always override any settings in the Android or iOS-device. Press button for Menu and select Diagnotics (Android) or Communication (iOS) and double check the settings. SPP (Serial Port Profile) must be selected. Have the Bluetooth devices been paired? Is Bluetooth enabled on the Android device? Note: iOS devices does not support Bluetooth SPP. Is the IP-address or host name correct? Use a Ping or Traceroute tool to verify that the PLC/controller can be reached. Is the Port number correct? Normally the port number should be 502 for Modbus/TCP and 102 for Siemens S7. Use e.g. port 4001 for Modbus RTU on TCP/IP. Is the Android or iOS-device connected to a guest network with restrictions? Is the Default gateway and Network Mask setup correctly in the PLC/Controller? 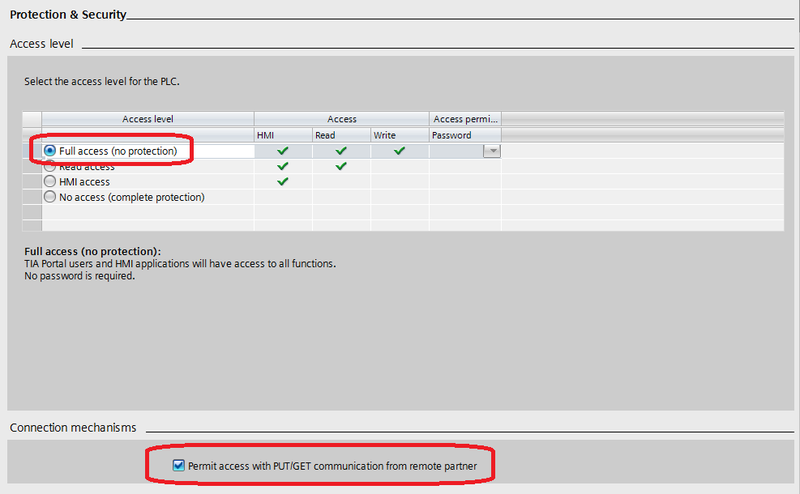 A missing Default gateway will disable connections that requires routing e.g. connections over Internet. Are there any Access control limitations allowing e.g. only certain IP-addresses or MAC-addresses to connect? The option "32 bit register" must not be checked unless if using a xLogic/RievTech PLC. Rx timeout must not be too low, the default value is 3000 ms and you should not enter a lower value. Handshaking signals swapped or misconfigured? Correct number of databits, stopbits and parity? Are the values for Siemens S7 Rack and Slot correct? Rack is normally 0. Slot is normally 0, 1 or 2 depending on type of PLC. For Siemens S7 1200, 1500 and LOGO! you need to make certain settings in the PLC. Read the appendices in this manual for LOGO! and 1200/1500 for details. If using Datablocks above 255, the setting for Last S7 Datablock must be increased in the settings on the Android or iOS device. At least one (1) variable in the panel (page) must read from the PLC/Controller to start the polling. Are the correct variable areas selected? Siemens S7: Default, Datablock, Memory (M), Input (I), Output (Q). Modbus: Default, Register, Input (I), Output (Q), Analog input (AI). Is the variable address correct? LOGO! M1..M64 = 0..63 in HMI Droid etc. Modbus R40001 = address 0 in HMI Droid. Can the variables be read at all from the PLC/controller? Example: Schneider gateway type SR3NET01BD has gaps in the Modbus map. The Modbus device must conform to the Modbus specification with respect to Modbus Function Codes and maximum message sizes. 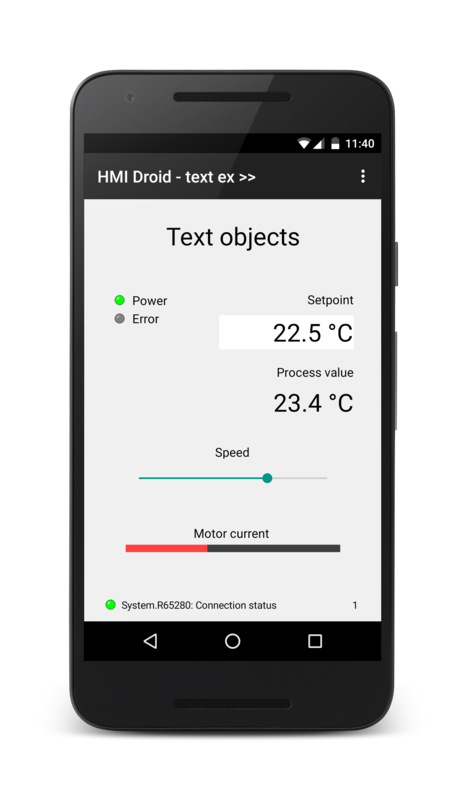 Try HMI Droid on a Modbus simulator. Some screenshots of a typical setup for a MOXA NPort 5110 port server. The app can crash if using a channel with a higher number than the setting for maximum number of channels. Android 2019-03-12 Problem solved in HMI Droid 1.7.8.94 (Beta). The Modbus/TCP protocol drivers can not use Slave Id/Unit Id > 247. All 2019-03-08 The range for Slave Id/Unit Id will be extended to [1,255] in the next releases. On devices with Android version below 5.0 and HMI Droid 1.7.8.90 or higher, the buttons are not displayed correctly regarding the pressed and normal button state. Android 2019-01-26 Problem is solved in HMI Droid 1.7.8.92. Siemens S7 Strings with a maximum length > 127 are diplayed as ** and can not be modified. Android 2019-01-12 Workaround: Use a maximum length ≤ 127. The OK button is missing in the Enter value dialog for the Input field object in Odrid HMI 1.3.1 to 1.3.5. iOS 2019-01-10 Workaround: Use the Numeric variable object instead of the Input field object. The flash feature for the LED object is not working in Odrid HMI 1.3.0, 1.3.1, 1.3.2 and 1.3.3. iOS only. 2018-12-24 This problem is solved in Odrid HMI 1.3.4. The Word swap communication parameter can default to Yes if not controlled from neither the settings in the iOS-device nor from the communication settings for the panel (page) in HMI Droid Studio. iOS 2018-12-20 Problem solved in Odrid HMI 1.3.3. 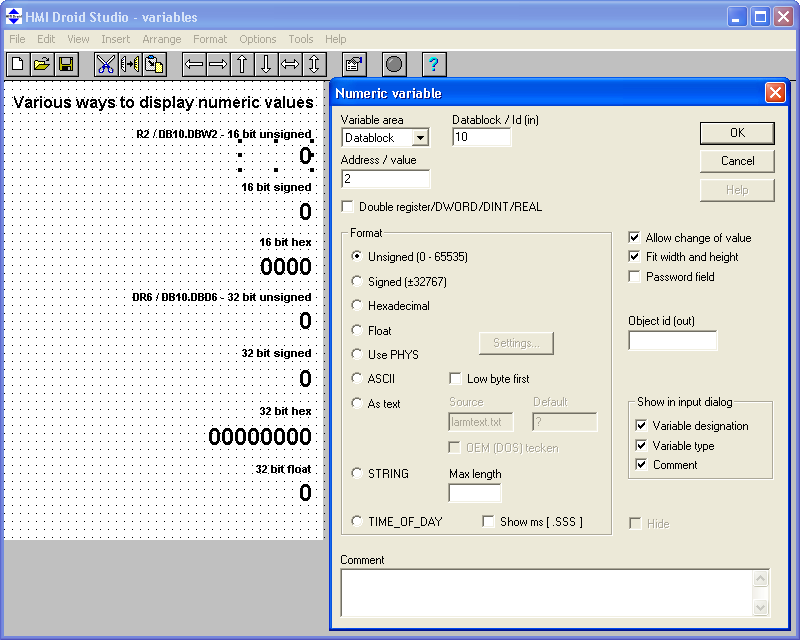 The 16 bit signed fixed decimal point format in the Numeric variable object does not display negative numbers correctly. iOS and Android versions 2018-12-18 Workaround: The PHYS format can be used as a 16 bit signed fixed decimal point format with one or two decimals. Entering av value > 125 for the Modbus Max Block Size parameter in the settings, can cause the Modbus communication to not work properly. iOS-version. 2018-12-14 Problem solved in Odrid HMI 1.3.2. In Odrid HMI 1.3.1, the menu is not displayed on iPad 6th generation (MR7F2NF/A) with iOS 12.1.1. iOS-version. 2018-12-13 Odrid HMI 1.3.1 on iPad air 2 (MH1C2J/A) with iOS 12.1.1. does not have this problem. In Odrid HMI 1.3.0 (Beta) and Odrid HMI 1.2.36, the menu is not displayed on iPads. iOS-version. 2018-11-22 Problem solved in Odrid HMI 1.3.1. In Odrid HMI 1.2.36, the status bar is not displayed in landscape mode on iPhones. iOS-version. 2018-10-31 Problem solved in Odrid HMI 1.3.0. The line chart will only display 50% of the values when using the Siemens S7 Communication protocol. iOS-version. 2018-09-02 Problem solved in Odrid HMI 1.2.36. File names for the panel (page) files must not use upper case characters. Android-version. 2018-08-18 This is by design, see Naming panels (pages). Reading boolean variables from the variable area AI (Analog Inputs) does not work. Test run mode of HMI Droid Studio and the iOS-version. 2018-08-11 Problem solved in HMI Droid Studio 6.7.7.2073 and Odrid HMI 1.2.36.